“Women’s Health” Magazine published an article about my health journey. It describes how I was “awake” while in a coma, my death, and my return to life. It has taken me many years to be well enough – and brave enough to share my story in this way. The article focuses on the onset of my illness. Opening myself to this process with the “Women’s Health Magazine” team, and the heartfelt responses I have received, has helped free me. I plan to write more about my experience in death and what my recovery taught me about the power to heal that lies within each of us. I have learned what it takes to recover when no medical professional believed it possible. And I have felt what it is to live in this world when one is ill and with physical limitations. I am grateful for the lessons gained in empathy, knowledge of the body and healing – and patience. For this didn’t come right away. I try to carry what I learned in everything I do. It is with this knowledge and love that I have been teaching others in my private practice for sixteen years. My hope in sharing this article and future ones, is to help instill hope, strength, and what I have learned about harnessing the body’s ever-present source of strength and renewal. Here is the link to the “Women’s Health” article. I would appreciate hearing your thoughts on this article and your interest in learning more. And if you feel to share, I would love to hear your story. 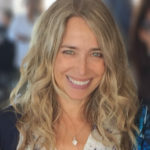 Julie Lyon Cheifetz, PMA-CPT, founder of Lifted Pilates™, has been teaching since 2002, certified through The Pilates Method Alliance, BASI Pilates® and PhysicalMind™ Institute. Julie developed Lifted™ to promote healing, healthy movement, active aging and rehabilitation. She writes about Pilates, healing and wellness topics on her blog, and shares teaching information and videos on Instagram. Her story was recently features in "Women's Health" magazine. Mighty Medius: Make it strong for healthy movement! Julie Cheifetz on Mighty Medius: Make it strong for healthy movement! Bei zhen on Mighty Medius: Make it strong for healthy movement! Sarah on Mighty Medius: Make it strong for healthy movement!